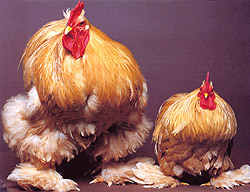 Cochins were first imported to America and England in 1845. The large Standard Cochins are truly awesome birds. 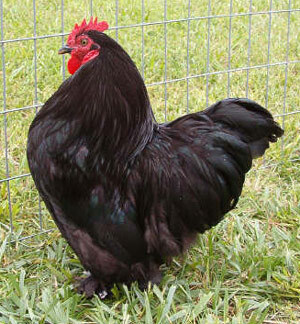 The Bantam variety make wonderful pets for children and is the easiest to tame. 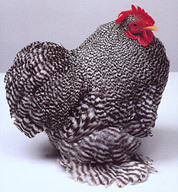 There are many color varieties of Cochins; Brown, Barred, Black, Buff, Golden-Laced, Partridge, Silver-Laced, and White. 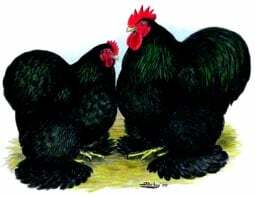 They are of the Asiatic Class and were originally called the Chinese Shanghai Fowl because they originated in the Shanghai district of China. The name changed later to 'Cochin China' and then finally shortened to just 'Cochin'. After arriving in England, they started a chicken 'gold-rush'. Several rumors fueled this mass 'Cochin Craze'. For example, one was that the birds could manage to lay several eggs a day. Another was that the meat was the finest of any meat in the world. However the most significant rumor was the one that claimed that a person could make a fortune with them and become rich in a relatively short time. 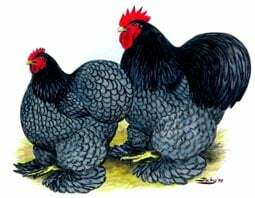 Unfortunately, as it turns out, the Cochin barely manages to lay a few eggs a week and despite their massive appearance, they are not as heavy as they appear, which makes them unattractive for commercial meat production. In about as much time as they became famous, their popularity declined as more people realized the true facts about these birds. Today, the only fame reserved for these birds is exhibition at poultry shows where they still prove to be the center of attraction. They are distinguished by a profusion of soft feathering and a great abundance of down fiber in the under-fluff. They have an extraordinary amount of long, soft plumage. This produces the apearance of making them look larger than they really are. 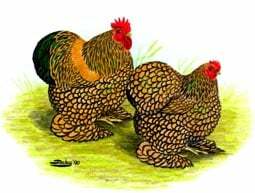 The female Cochins have a prominant development of feathers at the base of their tails which forms what is called a 'cushion'. The 'cushion' somewhat resembles a 'bun' - a popular women's hair style of the past. Close-fitting plumage is a serious defect, as is, lack of a cushion. When they were first accepted to the Standard in 1874, only the Buff, Partridge, White, and Black varieties were included. It was not until 1965 that the Silver-Laced, Gold-Laced, Blue, and Brown breeds were accepted. The Barred breed was admitted in 1982. Additional photos from "Extraordinary Chickens"